Jet Airways employees hold placards and banners during a protest at the Indira Gandhi International Airport in New Delhi yesterday. 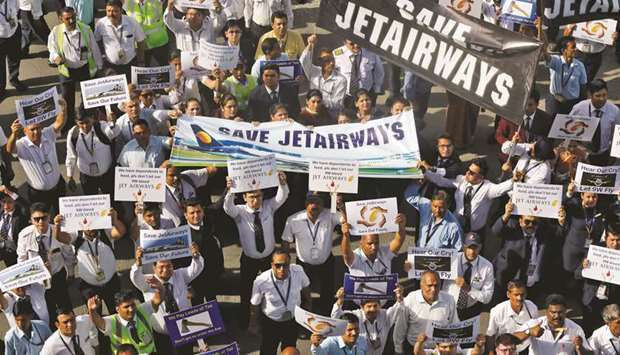 Several hundred employees of beleaguered Jet Airways held a protest at Delhi airport yesterday demanding to be paid and calling for the company to be rescued. Jet has been in a tailspin for months. All but around half a dozen of its 119 aircraft are grounded and all international flights are suspended until tomorrow. “Now the feeling is also of despair, frustration. Like, we want our salaries, at the same time we want to save our airlines,” added Shilium S, a maintenance worker. Prime Minister Narendra Modi’s government, for whom a collapse of Jet would be a blow as it seeks a second term in ongoing elections, convened a crisis meeting on Friday evening. Friday was the deadline for prospective bidders to express an interest in acquiring a 75% stake in Jet, which has debts of some $1bn. Etihad Airways, which owns a 24% stake, has submitted an expression of interest to buy a controlling stake of up to 75%, according to media reports. Alarm bells for Jet Airways first rang in August when the airline failed to report its quarterly earnings or pay staff, including pilots.